It's OK really. We understand. We realize that your remarkable lack of core principle just won't allow you to, ahem, call a spade a spade. We know that the screams of American citizens on the streets of Boston, the severed limbs, the sidewalks smeared with blood, really don't mean a damn thing to you. 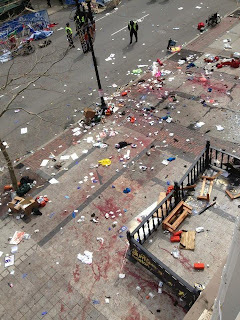 We no longer expect you, the leader of the free world, to summon up courage enough to label yesterday's bombing of the Boston Marathon what it was.......terrorism. And it happened on your watch Mr. Obama. Again. Fort Hood, Benghazi, and now Boston. Oh to be sure, some unnamed White House spokesman was quick to say that the attack was being "treated as a terrorist act". But you didn't say it. The word never passed your lips. Why not? What euphemistic phrase shall we invent this time Mr. Obama? "Work-place violence"? "Man-made disaster"? How about "sports-associated pyrotechnic incident"? Or maybe "sequester-induced explosive event"? How long before you or one of your execrable lackeys blames yesterday's attack on George W. Bush or the Tea Party? I have no idea who is responsible....foreign Islamists, radicalized American Muslim, McVeigh wannabe, neo-Nazi skinheads, heck...maybe even your old bomb-chucker pals at the Weather Underground are getting back in the game. Doesn't matter to me who it was, they are terrorists. Why won't you say it?